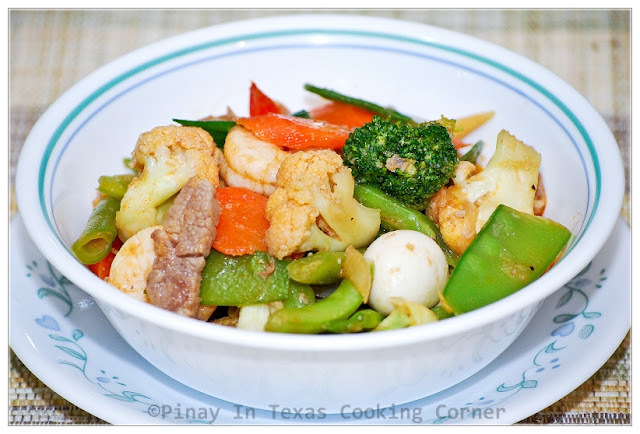 Chopsuey is another favorite dish in the Philippines. I love this because it is so easy to prepare and yet so healthy. You have veggies, seafood and meat, all in one recipe. In Chinese, the two characters for chop suey are pronounced "tsa sui" and in Mandarin or in Cantonese "shap sui," meaning "mixed small bits" or "odds and ends." As a culinary term, shap sui refers to a kind of stew made of many different ingredients mixed together. It has long been rumored to be an American creation rather than a Chinese one. Honestly, I don’t know who brought this to the Philippines! 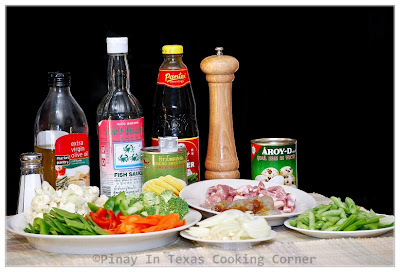 But whether it is the Chinese or the Americans, all I know is Chopsuey has been adopted by Filipino cuisine and it is one dish that we, Filipinos love. The delicious blend of flavors makes this dish truly mouthwatering. It is definitely a must-try! 1. In a wok , cook pork in 1/8 cup water until water evaporates (about 10 mins). 2. Add olive oil and sauté garlic until light brown. 3. Add onion. Saute until translucent. 4. Add shrimp cube. Saute until melted. 5. Add green beans and stir-fry for 5 minutes. 6. Add carrots, green and red bell pepper and stir-fry for 3 minutes. 7. Add cauliflower and snow peas. Stir-fry for 3 minutes. 8. Add fish sauce and oyster sauce. Mix well with other ingredients. Cover and simmer for 3 minutes. 9. Add broccoli, baby corn, quail eggs and shrimps. Add salt and pepper to suit your taste. Simmer for another 3 minutes. 10. Add green onions. Mix well. Cook for another minute. 11. Remove from heat. Serve with hot rice. Note: I don't add broth to my chopsuey. Vegetables can release just enough water during cooking.